On Monday, Kenny Hoover picked me up and we went down to Santa Ana for lunch with the boys. 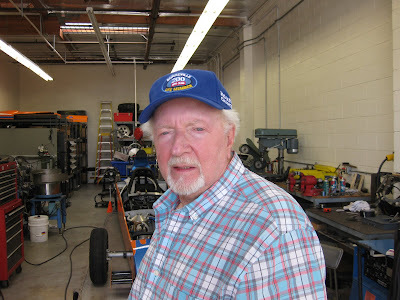 Kenny had to show off his new Blue 300 MPH Chapter (of the Bonneville 200 MPH Club) hat because he set a record at the Bonneville World Finals last week at 330 MPH. 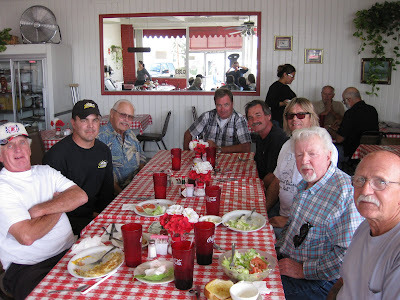 We were leaving for the Red Hill Cafe and up drove Mike Kuhl and Mike from Indy, so they joined us for lunch. 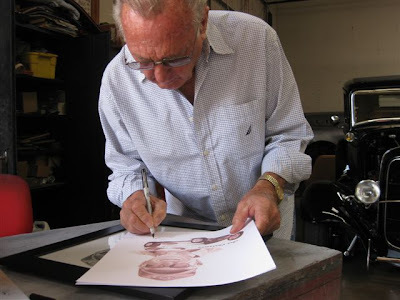 Art missed out on lunch, but he showed up at the shop soon afterwards. 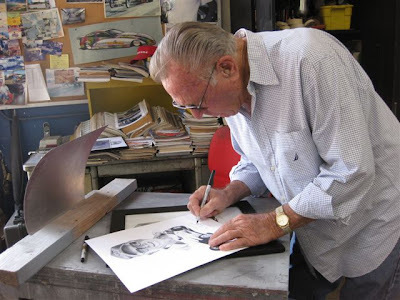 He was kind enough to autograph a few copies of his portrait drawing by Shannon. I will be bringing them to New Zealand with me for her to have. A couple of them were printed in black ink and a couple in Sepia tones. 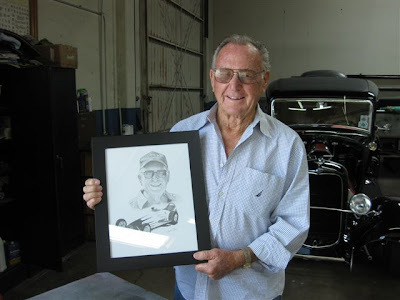 Art is posing with the framed original pencil drawing. Shannon's art talent keeps getting better and better with each drawing. Of course I'm somewhat proud of her. Roy showed us the new rearend he's putting in the roadster. He's already making big plans for the car for next year. Keep going faster, breaking records.